It’s the latest attempt by conservative legislators to roll back the rights of LGBT citizens. The “Texas Privacy Act” was introduced on Thursday by Texas lawmakers to prevent transgender people from using the bathroom of their choice, emulating efforts by other states such as North Carolina. Under the proposed law, concerned citizens would be able to report the behavior of anyone they think is using the wrong bathroom. How these complaints would be processed and to what extent citizens are encouraged to take the law into their own hands is unclear. "It's the right thing to do," said Lt. Gov. Dan Patrick at the Texas Capitol. "The people of Texas elected us to stand up for common sense, common decency and public safety." Opponents of the bill see it differently. "It's unnecessary, discriminatory and inconsistent with the constitutional value of equal protection for all," said Rebecca L. Robertson, the ACLU's legal and policy director, said in a statement. "Make no mistake — the invidious intent of SB6 is to deny transgender Texans the ability to participate in public life." This bill is not a high-priority item so it has no real chance of getting passed into law anytime soon, according to Republican Speaker of the House Joe Straus. But it still carries symbolic weight — it’s the latest attempt by conservative legislators to roll back the rights of LGBT citizens, an effort that will likely gain momentum under a Trump presidency as conservatives take advantage of a supermajority in Washington and install a new member to the Supreme Court. Since 2015, 20 states have considered introducing gender restrictions on bathroom use, but only North Carolina has succeeded in passing a bill including such a measure. It became one of the most controversial bills in recent memory. In response, the state is facing a multi-billion dollar boycott from businesses, lobbying groups, and ordinary citizens. 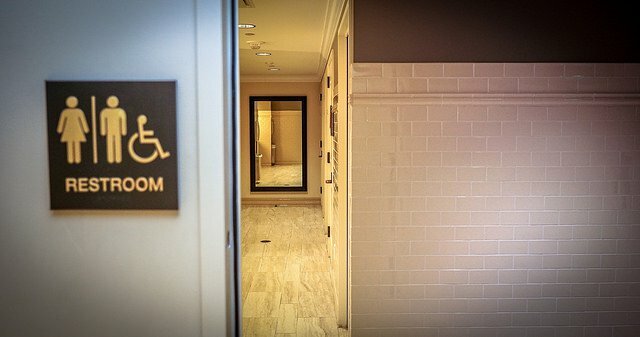 California has taken the opposite route by passing a law that mandates all single-occupancy bathrooms be gender-neutral, and businesses throughout the country are taking up the cause by making their facilities more accommodating. The Obama administration has also passed an order that requires all public schools to make bathrooms accessible to transgender students. Texas led a 13-state lawsuit to block the measure and in August it was suspended by a Texas federal judge. Discriminatory bathroom bills, aside from their prejudicial intent, are fundamentally unconstitutional, argues Scott-Skinner Thompson of Slate. Courts throughout US history have found that citizens have a basic right to privacy. Suspecting and then punishing a trans person for using the "wrong" bathroom would be a violation of this principle, as it denies them the right to maintain their privacy. After all, think about the practical details of these bathroom bills. To verify that someone is in fact transgender would involve a cruelly excessive invasion of privacy. Similar to the law in North Carolina, the bathroom provision could ultimately serve as a Trojan Horse — a headline-grabbing measure meant to stoke people’s anger and distract from other, more substantial provisions that accompany it. In the long term, the bill in North Carolina may be more remembered for how it also gutted state protections for LGBT people.